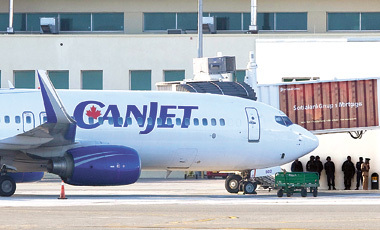 April 20th 2009, Kingston, Jamaica, Stephen Fray, a 20-year-old Jamaican, gained access onto a Canadian airline, CanJet flight 918 just after passengers boarded the jetliner bound for Cuba. The young man forced his way pass security with a hand gun gained access to the cockpit, fired off a round and then demand to be flown off the island. "There was quite clearly a breach of security at the airport, and I've asked for an investigation to be done immediately," said Prime Minister Bruce Golding, who arrived on the scene overnight to oversee talks with the hijacker. Flight 918 was carrying 159 passengers and 8 crew members. The young man was described by police as "mentally challenged." The young man brandished his gun and forced his way past several security checkpoints. At least two people chased after him but failed to prevent him reaching the tarmac at Sangster International Airport. Witnesses report that the young man wanted to go to the United States. The young man’s father and two brothers aided the hostage negotiators before the talks broke down. After eight hours of negotiations, Jamaica’s soldiers stormed the aircraft and arrested the man without further injury.